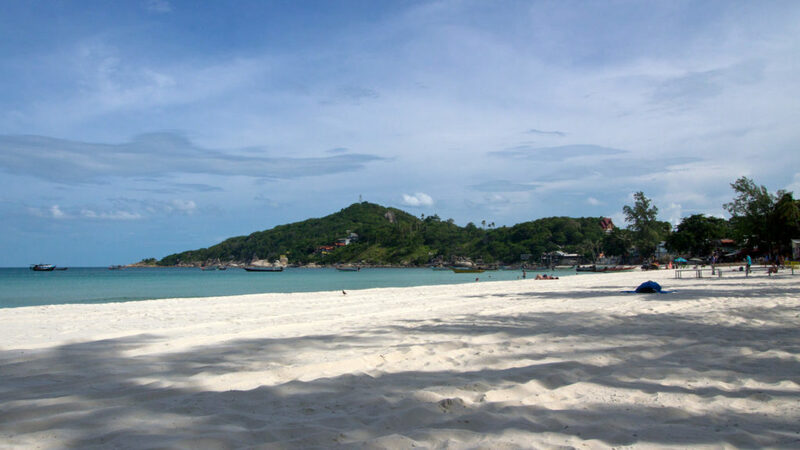 The island of Koh Phangan offers plenty of beaches. It’s not easy to find out which are the most beautiful ones. In particular, on a map of Koh Phangan I counted more than 30 (!) of them. Besides the known beaches like Bottle Beach, Haad Rin/Full Moon Beach and Haad Mae Haad with its adjacent island Koh Ma there are plenty more! It’s best that you do trips on your own and therefore you should rent a motorbike on Koh Phangan. That way you are completely free and you can decide for yourself how long you want to stay at one of the beaches or if you want to visit the next. Of course you can do your trip with one of the shared taxis, but you won’t be really independent and it’s likely to be more expensive. Which are the most beautiful beaches of Koh Phangan? That’s not so easy to tell because everyone has different expectations of a beautiful beach. In this article I will show you my 10 most beautiful beaches. Everyone of them is worth a visit! The island of Koh Phangan doesn’t have its own airport, which means that a boat trip to reach the island is necessary. With a flight to Koh Samui or Surat Thani you can only bring one leg behind you. Tickets for flights are best found at Skyscanner. In addition, you can travel by bus or train to Surat Thani, but even there you have to change to a boat at the end. There are several providers to choose from such as Lomprayah, Seatran, Raja Ferry, etc. Tickets and connection times can be found on 12go.asia or Get Your Guide. The bungalows in the Sea Love Bungalows are rather small, but they and the whole area have an absolute feel-good atmosphere! Located directly by the beach, Sea Love offers a beautiful and quiet environment. The village of Ban Tai with many restaurants, shops and a 7-Eleven is only 5 minutes walk away. There is also a swimming pool and plenty of hammocks, where you can admire every evening one of the wonderful Koh Phangan sunsets. For more hotels in Koh Phangan visit this page. The Malibu Beach is located in the same-named Malibu Beach Resort up north in the village of Chaloklum. It is becoming more and more popular, but during the off-season it is still a very lonely beach. The sand is amazingly white and there are lots of palm trees, a small bar, which plays some reggae music at most times and of course clear, turquoise water. Furthermore, there is a terrific view at the mountains of Koh Phangan. The beach is definitely one of the highlights of the island. However, during low tide it is a bit difficult to swim over there, because the water is very shallow during this time. Nevertheless, you can always have a great time at the Malibu Beach and it’s absolutely worth a visit. Haad Seekantang, or better know as Leela Beach (thanks to the same-named Resort at the beach), is located in the southeast of the island. More precisely in the village of Haad Rin. It’s really easy to find the way since you only need to follow the signs directing to the Leela Beach Resort. The street is not that good, but at the end you will be rewarded with a really beautiful beach. The beach is – apart from a few guests from the resort – pretty empty. The sand is fine and amazingly white. There also some small bungalows directly at the beach. The water is truly clear, but quite shallow. So if you want to swim, you need to go some meters away from the coast. It’s still perfect to cool down a little. Furthermore, you have a superb view at Koh Samui. Probably still a secret spot! 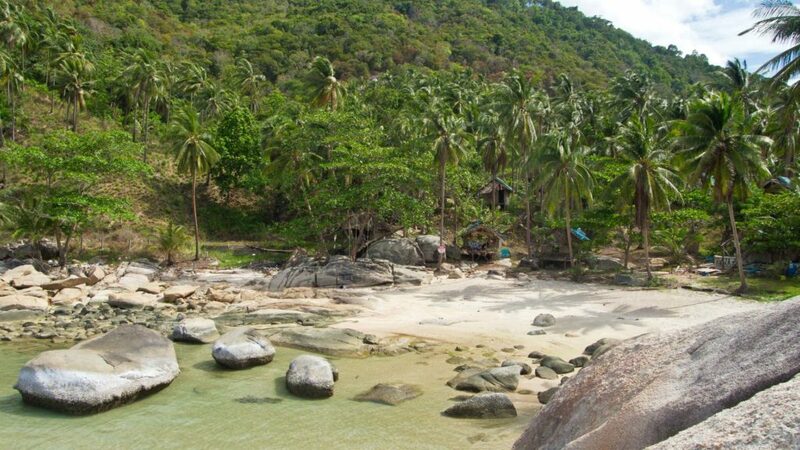 The Haad Rin Nok is famously known to be the Full Moon Beach where you can find the infamous monthly parties. Often referred to as being really dirty and full of rubbish. I made a different experience and that’s why in my opinion this beach belongs to the 10 most beautiful beaches of the island. I was there even shortly after the Full Moon Party and the beach and everything was very clean. No bottles, no rubbish or something else was laying around. There were trash cans every couple of meters and everyone did his part to keep the beach clean. The beach itself is located at the east coast of the island in the same-named village of Haad Rin and offers amazing white sand. Probably the whitest and finest sand I’ve seen on Koh Phangan. The water is also clear and makes you want to go for a swim. 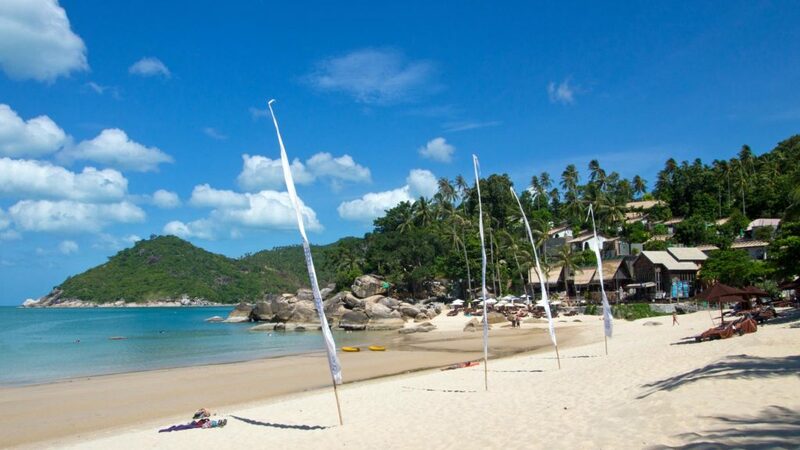 The right part of the beach is, however, not suitable for swimming because here the longtail boats lie at anchor. This is also were the longtail boats start their trips to the surrounding beaches. Absolutely one of my favorite beaches of the island. Against all opinions, it is very clean. Excellent to relax and swim. In the evening you can also eat something in one of the beach restaurants and watch a fire show. If you like, you can enjoy a drink or two at the beach bars, too. The most famous beach bars would be the Cactus Bar and the Drop In Bar. 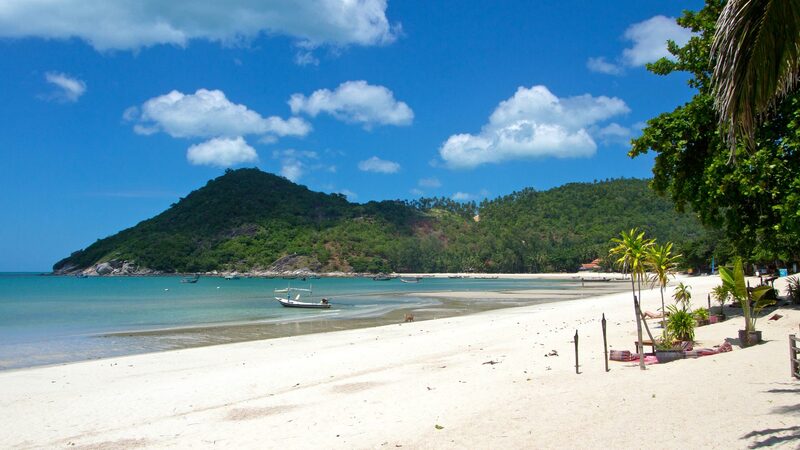 The village of Thong Nai Pan is located in the northeast of Koh Phangan and has two beaches. To get to Thong Nai Pan, you need to take a road in the village of Baan Kai heading north to the inside of the island. The street is pretty new and easy to drive. But the ride takes about 20-30 minutes with a motorbike. At the smaller beach Thong Nai Pan Noi you can find lots of luxury resorts and here are sometimes quite a lot of people at the beach. The bigger beach Thong Nai Pan Yai, which I recommend here, is on the other hand really empty. There are indeed a couple of bars and restaurants at the beach, but you will have the beach almost for yourself. The sand is fine and smooth and really flat in the water. To take a good swim you need to go a few meters off the coast. The water is pretty good to take a bath to cool down a little! Not as clear as some of the other beaches but still very clean! The Bottle Beach is one of the better known beaches of Koh Phangan. It’s really difficult to get there by land and almost every visitor uses a longtail boat in order to get to the beach. In spite of the fame, the beach is never too crowded. The sand is fine and smooth and the water is – after a few stones at the beginning – really awesome. Then there will be only fine sand on the ground. Ideally suited for swimming since it’s gets deeper after a short distance. 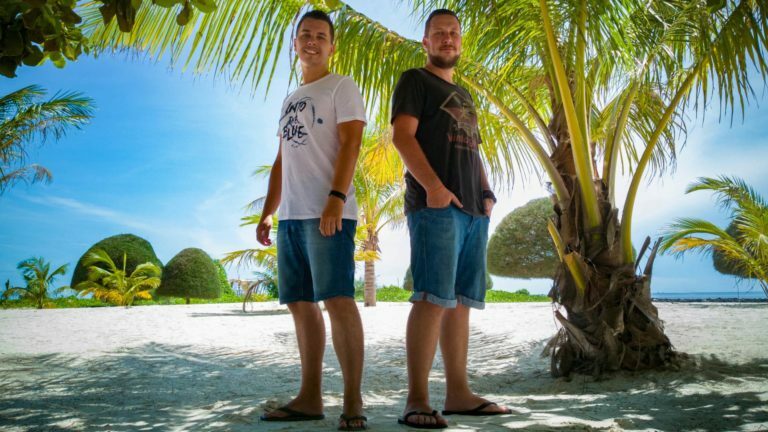 Here you can read our article about our first visit to the Bottle Beach. 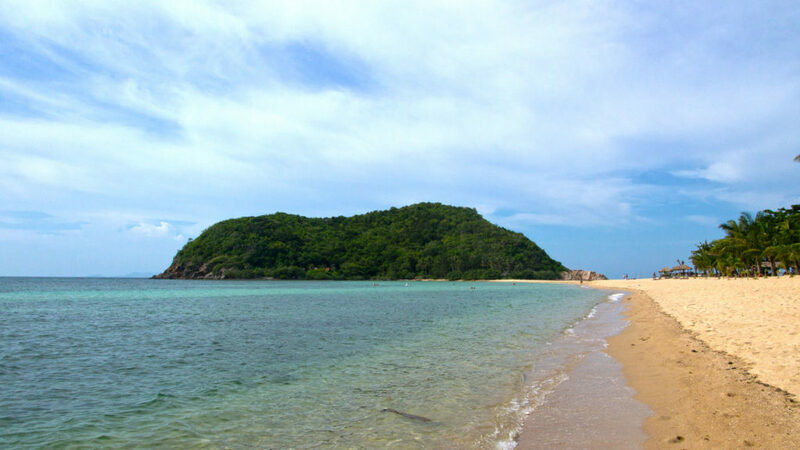 The Haad Khom is located in the north of Koh Phangan, not very far from the village of Chaloklum. From there you only need to follow a small road directing east along the coast, almost until the end of the street. There you can find a small rock which is marked with Coconut Beach. Here you can drive inside and park your motorbike. The beach is always empty and just beautiful. Smooth sand, clear water and not too many people. A perfect spot to relax and swim. The beach of Haad Mae Haad has often quite a lot visitors, but is so extensive that it doesn’t look too crowded. I think it’s a result of the upfront beach bungalows, a restaurant and a few Thai massage shops with a ocean view. The sand is a bit rougher and the water not too deep. Apart from that, it’s definitely a beach that is worth a visit. If you swim out a few meters you can even snorkel a bit and discover the underwater world. The unique thing about that beach is the adjacent island Koh Ma, which you can reach over a sandbank. Here you can go for a walk and enjoy a nice view at Koh Phangan and the Haad Mae Haad. 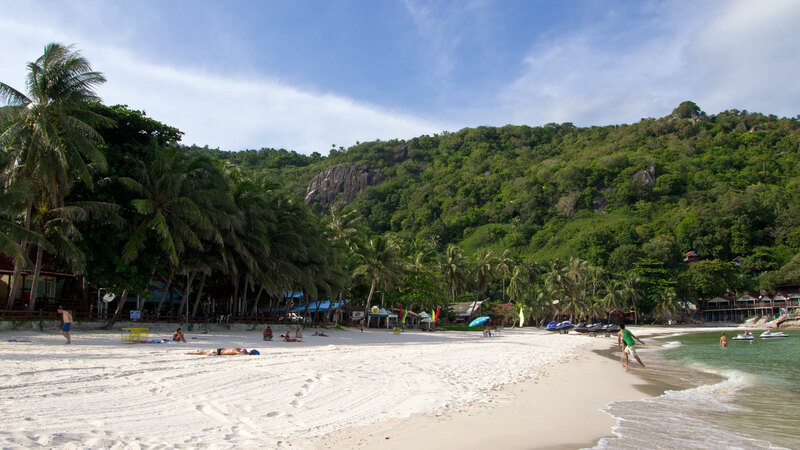 The beach of Haad Salad is located in the same-named village at the west coast of Koh Phangan. The beach is not too big and despite the resident resorts quite empty. The water is truly clear and the sand is fine and white. Here you can relax for a while. There are also a couple of restaurants. Nevertheless, it’s really quiet and you can totally enjoy the atmosphere. A few meters off the coast there is also a large sandbank, which you can see from the beach with it’s clear and bright turquoise water. Really beautiful. One of my favorites. Haad Son is located in a small bay at the west coast of the island. Signs refer to the “Secret Beach”. There is a resort and a small restaurant at the beach where you can sometimes hear some music at the beach, but it’s not too noisy. The beach is really small but dreamlike. Crystal clear water, fine white sand and just perfect for a swim. However, at low tide you have to go a little bit further to swim. 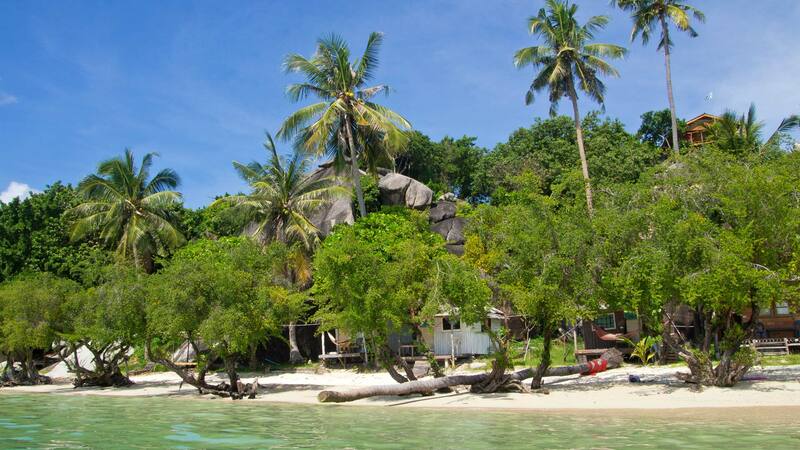 You can also do some snorkeling over here or at the Koh Raham bar, which is a part of the Haad Son Resort. But there are two downsides. Like on many of the Koh Phangan beaches, you don’t have too much shady spots over here and it can get very busy during high season. Anyway, this is one of my favorite beaches on Koh Phangan and I can only recommend you to take a look at this very beach! The Haad Thong Reng is nestled in a small secluded bay. You can reach it when you cross the small bridge at the end of the Haad Than Sadet and climb between the bungalows onto the rocks. Of course you have to go down on the other side afterwards to get to the beach. The beach is pretty much empty and there are almost no visitors at all. The bungalows have already fallen into ruins and that’s why most people don’t go all the way to the Haad Thong Reng. If you want to have something to drink or eat, keep in mind to bring some along with you, because there aren’t any shops. 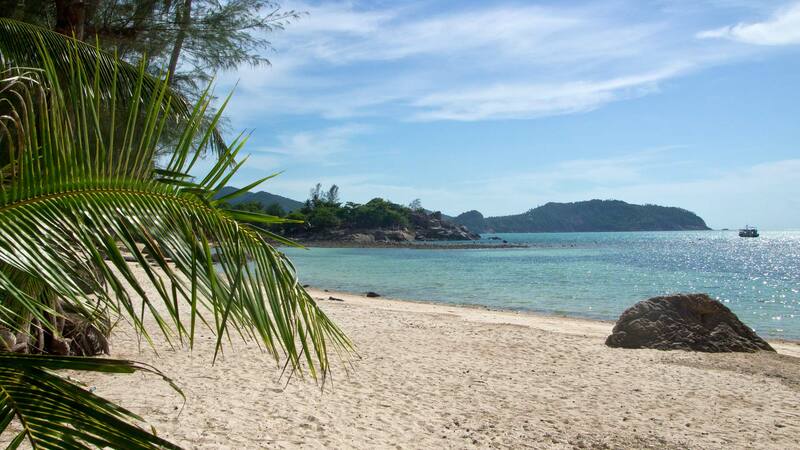 Besides that, the Haad Thong Reng consists of beautiful granite rocks, fine white sand and crystal clear water. You have to go out a little bit further to actually swim, which isn’t too bad in my opinion. A small and hidden insiders’ tip on Koh Phangan. 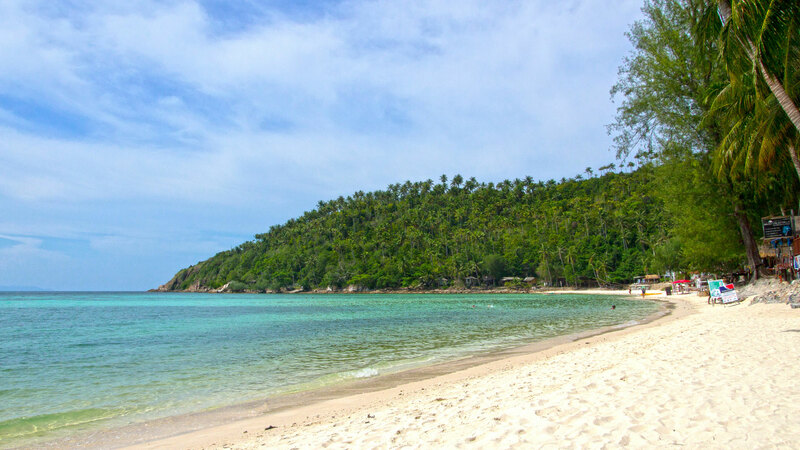 Like I said in the beginning of the article, Koh Phangan offers more than 30 beaches. This is of course just a short, personal list. I can recommend all of those beaches without any doubt. 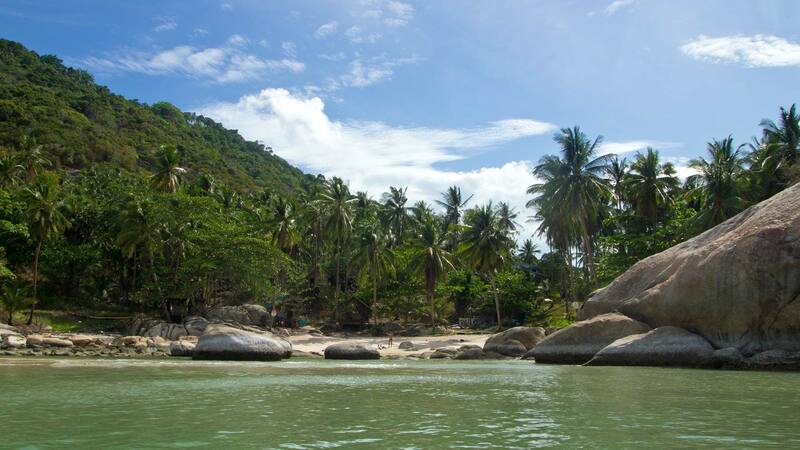 If you discover Koh Phangan with a motorbike and you are a fan of beaches, then you will love those! 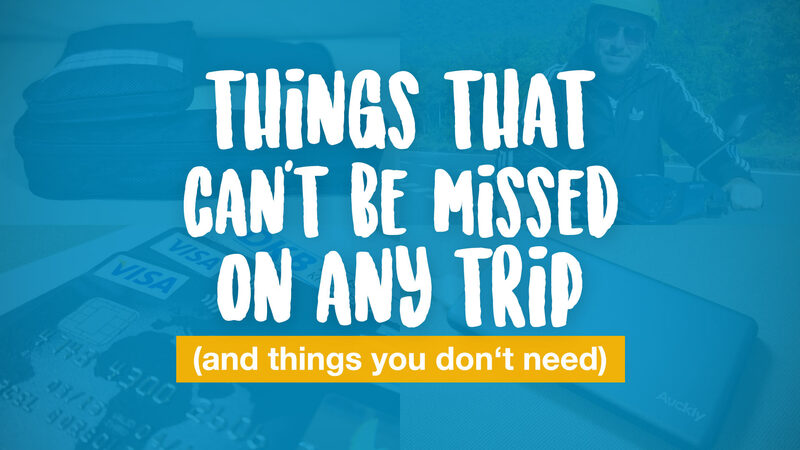 Do you know a beach that definitely belongs in this list? Did we miss your favorite one? Leave us a comment right now! We are looking forward to your opinion. Hi, I'm Tobi, a passionate travel blogger and freelancer in translations and copy writing. Mostly I travel around Southeast Asia and work remotely from different locations. If you want to know where I am or what I'm doing, just follow me on Twitter, Instagram or Facebook. 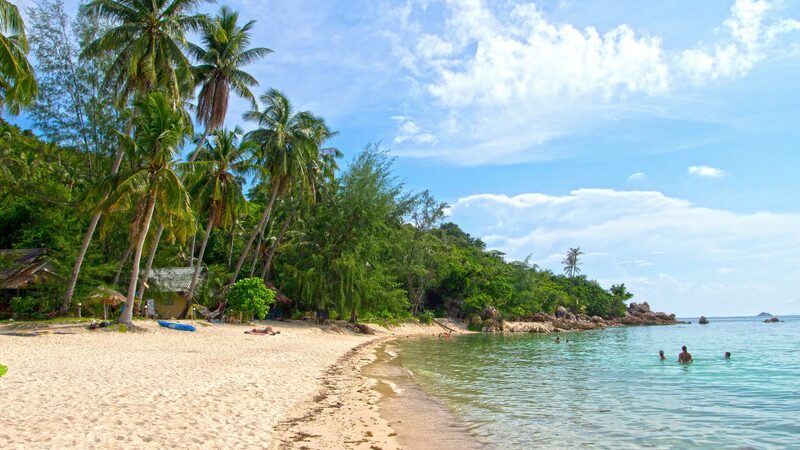 Hi Tobi I have visited all the beaches you recommend in koh pha ngan and found your information reliable and helpful. Thank you! I found one beach not on your list which I found to be the best one…Had Tien – I discovered it when we visited had yuan, had Tien is next door to it…the sand is not as fine but the atmosphere at the resort there – the sanctuary – is beyond description…we ended up staying there for over 3 weeks. Im not sure but seems like no airasia flight from jakarta to Koh Samui.. so is that also convenient to start from surat thani airport? and should continue by ferry also? you can fly via Bangkok and Surat Thani or Kuala Lumpur and Krabi with Air Asia and then continue with bus and boat to Koh Samui or Koh Phangan. Many travelers do it like that, so it’s easy and convenient. It’s an amazing destination for new year celebrations in Asia. I would to spend my new year there. 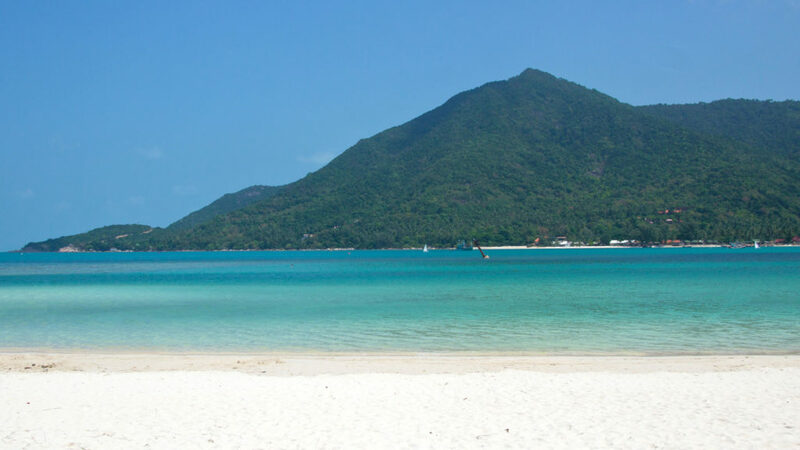 I am going to stay in Koh Samui soon for two weeks, my boyfriend and I want to spend the day and one night in Koh Phangan but it is so difficult to choose which beach to see and where to stay. If you had to choose one beach that was your favourite on the island, with nice places to eat and ability to grab a beer- which beach/ area would you recommend???? HELP! that’s a really hard question. Depends on what you want. Haad Rin would be a good option with the Haad Rin Beach or Leela Beach, which are both beautiful. But Haad Rin is a lively place so there a lot of Beach Bars, Restaurants and it’s also where the Full Moon Party happens every month. If you are looking for something more quiet I think I’d prefer Haad Yao oder Haad Salad at the west coast of Koh Phangan. Both have a nice beach as well as some bars and restaurants nearby. Just wanted to edit that the sand at Leela Beach is not the fine powdery sand you’ll find any haad Rin. But it is very secluded, quiet, and beautiful. no Leela Beach is not as fine as Haad Rin Nok, but it’s quite nice there also. Like you said secluded and quiet. it’s my first time in Thailand, i’m travelling with my husband and our 2 kids (a toddler and a baby). 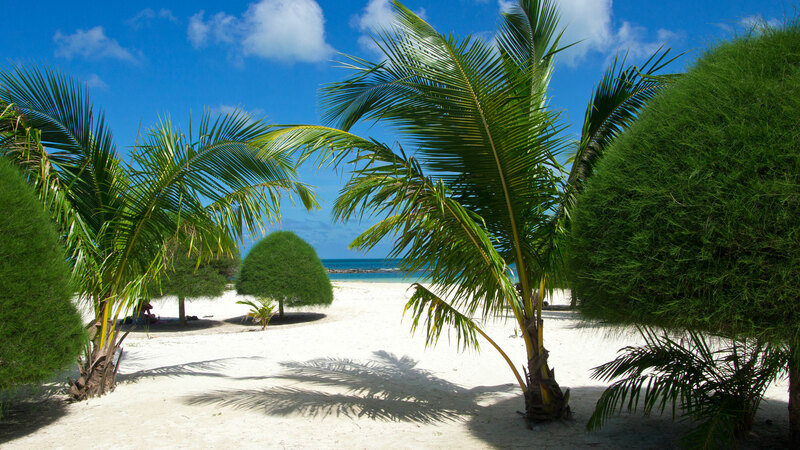 we love cristal clear water beaches and bussieness (where action take part) – where should we stay? Are you referring to Koh Phangan or Thailand in general? I and my friends we are going to koh phangan at 2 sep 2017.
whats is your suggestion about hotel and parties ? and any good activities there? there is quite a lot to see on Phangan besides the full moon party. If you are only looking for parties there are a few during the full moon week like half moon festival, jungle experience, waterfall party and that’s not all. But I would suggest you rent a scooter and explore the island. Phangan has beautiful beaches, waterfalls and terrific viewpoints. You could also go to SlipNFly a kind of day party during the full moon week with a huge slide and a swimming pool. As for hotels you really should book in advance, since the whole island will be full for the full moon party. You could stay in Haad Rin where the party takes place, but also any other place all over the island is good. There are shared taxis which will bring you to the full moon party, so you don’t have to worry about that.